Abstract: Understanding the realistic dilemmas of college physical education has important significance to the fu-ture development of college physical education. 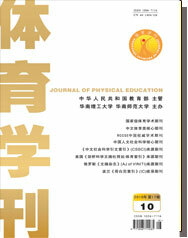 The author analyzed the dilemmas of college physical education in China from multiple perspectives, and concluded that college physical education was facing at least the following 6 dilemmas: the weakening of college physical education functions; the actual status of physical education curriculum being low; the ignoring of physical education by the currently effective education system; public opinions’ indiffer-ence to physical education; school physical education theories’ lack of guidance for practice; physical education searches’ lack of guidance for physical education teaching. On such a basis, the author put forward ways out for re-solving the dilemmas of college physical education.